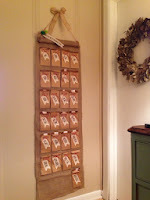 last year i made a christmas advent calendar to help the kids countdown the days until christmas. they were too little to recognize the numbers, but we are working on it this year. 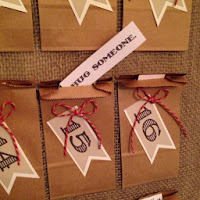 each brown paper bag has a tag inside with something to do that day to celebrate the christmas season. it's fun having an "activity" to do together everyday. 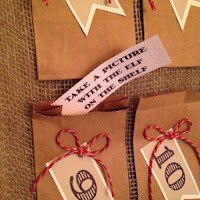 we even hid our elf on the shelf in one of the bags for the kids to find. here it is hung on the wall. this project was easy and fairly cost effective. lay your burlap out and glue a wrapping paper roll at the top of the calendar to be able to hang with string (make sure the burlap completely covers the wrapping paper roll). glue each bag on the burlap with equal space in between bags. glue one tag tied with twine to each bag. write holiday activities to do together to put in each bag (example: drive around looking at christmas lights!). 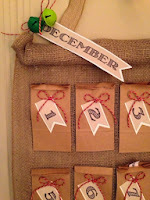 string the twine through the wrapping paper roll to hang. add a bow at the top! happy christmas countdown!